If you come to this article, it means that you may have familiarized with the error of - " the device is not ready" which can be caused both at hardware and software. Are you like to fall twice in the same trouble of "The Device is not ready". To help you get rid of it, we list 5 typical and practical solutions in the following post. 1. To begin the solution tutorial, people who suffer from the "The Device is Not Ready" error may desire to know why can it happen? "The Device Is Not Ready" error is a kind of common error which often occurs when people want to access data in an external data storage device. If you want, you can check its symptoms to see the clue that results to your hard drive not ready problem. The device shows 0 bytes will pop-up the window. The device is not accessible or the device is not ready also show the same instruction window. 2. Recover data from inaccessible hard drive or flash disk before resetting your device. Once reset the device, all the old data will go. If you don't want to miss anything essential for you. Recover files from the hardware or software which you want to repair firstly, you can try Bitwar Data Recovery to retrieve your files. Bitwar Data Recovery software is specially designed to retrieve you're deleted/formatted/RAW files from Windows PC, laptop, hard drive, SSD, memory card, USB drive, SD card, digital camera, multimedia player and other storage devices. Launch Bitwar Data Recovery software on your windows and select the inaccessible hard drive or flash disk and then click "Next". There are three modes to scan data, you can choose "Quick Scan" mode to scan first, If you cannot find files on this mode, try Deep Scan. The deep scan will search every sector of the disk to find all existing files. When you want to recover formatted files from the inaccessible disk, you should select "Formatted Recovery" here. Select the file types what you want to recover, if you have no idea, you can also choose "Select All Types" to recover all files from the inaccessible disk. Then click "Next" to start scanning. After the scan, you can filter the scanned out files by file name, type, path and time. Then double-click the file which you want to preview them to make a selective recovery. After determined, click the "Recover" button to save it to another partition or other external device that can be accessed. This error often occurs on external drives, so make sure that the device is properly connected to your computer. You can also unplug it and plug it back in to establish the connection or disconnect the device and plug it into a different USB port. If the "device is not ready" error disappears, you can make sure both the digital device and related USB port are not damaged. You can use another connecting cable to connect between the external hard drive and computer to see if it is connecting cable’s fault. Or you can attempt to read this device on another computer that we recommend you to choose a computer which has read this device before and can work normally. If the device driver is not installed, corrupted or missing, you will receive the warning message as well. Try to re-install the device driver. Step 1. Type device manager in the search box, right-click it and select Open. Step 2. Expand and navigate devices on the right panel to find out the device that is not ready, right-click the device and select Uninstall. Step 3. Keep your device connected and restart the PC. Windows will attempt to re-install the driver. Then Restart your computer and check this action whether solved the problem. You should check how this device shows in Disk Management, drive shows not initialized or unallocated. If your drive has not been initialized, the drive is not recognized. a) Press Win+R (Windows logo key and R key) at the same time. b) Type diskmgmt.msc in the run box and then press Enter key. c) Right-click on the name portion of the disk entry, where it says Disk [#]. d) Select Initialize Disk from the right-click context menu. e) After that, you will be given detailed operating prompts. Just do as told. Sometimes, users who encounter the device is not ready in Windows 10, Windows 8 or Windows 7 will find their drive shows unallocated space in Disk Management. Now, you can create a new partition on the unallocated space. 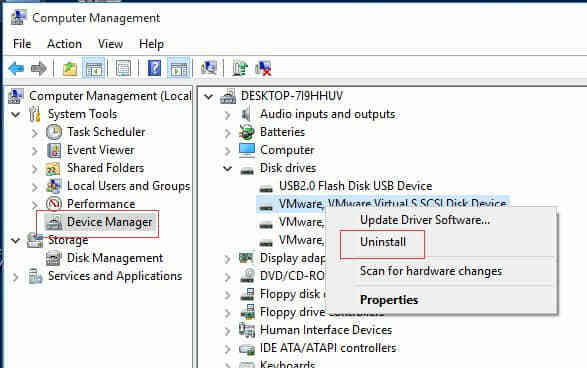 Right-click the unallocated space, choose New Simple Volume and then follow the wizards to complete this task. If the unallocated space contains some important data, you should try to recover lost data from the unallocated space first. Solution 5. The Drive shows RAWometimes, users who encounter the "the drive is not ready" error message will find their drive shows as a RAW file system. So you should format your RAW drive to NTFS/FAT32. Warning: Formatting will delete all original data on your hard drive. Therefore, it is recommended to recover all data from the RAW drive before formatting. 3. Click Start > OK.
After this, your SD card has been converted to NTFS, then, you can reuse and save files in it again. You can try above method one by one and find the one which can work for you. We hope that at least one of these solutions helped you fix "The device is not ready" error code. Take the right steps to recover data and rectify the problem with ease. If you are concerned that important data is missing during the fixing process, use Bitwar Data Recovery to recover them first. You can also get back to our website of https://www.bitwar.net/ for more articles about the data recovery! Have a nice day!